Of all the lesser-known jazz musicians whose works excites me, none rank higher than Willis Jackson. He was also one of the most prolific jazzmen you probably never heard of, having recorded nearly fifty albums in his lifetime. Depending on who you believe, Jackson was either born in 1932 (Scott Yanow) or 1928 (Feather & Gitler). Both sources agree he died in October of 1987. He began studying the piano at age ten, after which he switched to clarinet and then tenor sax. His first professional performance with the sax took place when he was fourteen years old. During his long career he performed with Cannonball Adderley, Blue Mitchell, Ruth Brown (to whom he was married for eight years), Cootie Williams, Dinah Washington and others. With a lineup like that, and Bob Porter for a producer and none other than Rudy Van Gelder as the recording engineer, it’s easy to see why “Bar Wars” earns top honors with Yanow and others. As originally released on vinyl, “Bar Wars” had six tracks. The CD reissue added two more, both of which are alternate takes of tracks already there. I have to admit that I’m of two minds about that practice. Part of me would rather hear two other songs that weren’t on the original. Even with the two additional tracks the running time is only just under 46 minutes, so there was plenty of room for more material. Something to keep in mind if anyone ever decides to put together a Willis Jackson career retrospective boxed set. Jackson starts it off, naturally, and then hands it over to Martino, whose fretwork dazzles. Then it’s Earland’s turn, and he shows everyone why his own first album was called “Mighty Burner”. The title track is a Jackson composition, and is an enthusiastic piece of music that gives everyone an opportunity to show their stuff. Even though it runs almost seven minutes, it always leaves me wishing it was longer! I don’t know a whole lot about Pat Martino, but his work on the guitar is a real high point of this album. Which is not to say that Jackson slacked off, but if someone didn’t know whose disk this was, he could almost believe it was the guitarist’s. Almost. “The Breeze And I” is not a Jackson composition but is another upbeat number that sounds as though it gave the guys a fun run. Idris Muhammad goes quietly (and not-so-quietly!) crazy in the background as Jackson wails on his sax, after which Martino steps forward and tears up the fret board as he continues Jackson’s pace. Then Earland takes over with his “mighty burner” and carries on until Jackson once more takes the lead. “The Goose Is Loose” is another Jackson piece, and Earland starts it off with his keyboard burning from the first note, while in the background Muhammad beats the crap out of his kit to stay ahead of him. “Goose” is a wild ride, so fasten your seatbelts! “It’s All Right With Me” is the final track from the original vinyl LP, and it’s easy to see why they included it on the comparatively cramped LP configuration. What’s not so clear to me is why they chose to include a different take of this on the CD rather than a new song. Having just listened to both versions for the first time in quite a while, I have to say that the second version, while good, was a waste of disk space. Don’t get me wrong, I do like the alternate version of “It’s All Right With Me”, but I believe I would have liked something else better. 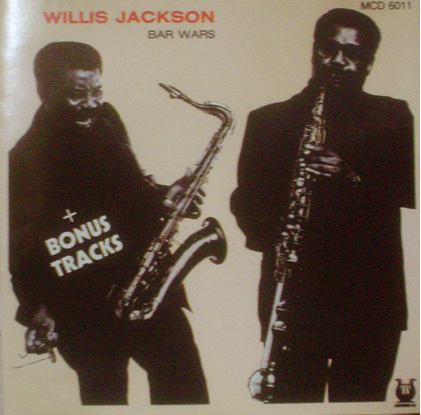 All-in-all, if you can find a copy of it, I think you’ll find that Willis Jackson’s “Bar Wars” will make an excellent addition to your personal playlist for a Saturday, or any other, night! Or you can read Scott Yanow’s brief bio of him on the allmusic.com web site, here http://www.allmusic.com/artist/willis-jackson-p89851. You can also go to oldies.com and read this brief bio of him which was taken (with permission) from Colin Larkin’s “The Encyclopedia Of Popular Music”: http://www.oldies.com/artist-biography/Willis-Jackson.html.